Control alternative hosts. Avoid planting susceptible crops in high TSV risk locations, especially close to and down wind of high density parthenium. A severe sunflower decline disease, now known to be caused by Tobacco streak virus (TSV), has caused a loss of approximately 20% across the sunflower industry in central Queensland (CQ) since 2004. TSV also caused major losses in mung bean crops throughout CQ in early 2007 with up to 70% yield reductions in severely affected crops. Losses have been both direct, from crop damage caused by the virus, and indirect, from reduced grower confidence in sunflower. TSV was identified as the cause of the sunflower disorder in 2006 and research (jointly funded by the GRDC and CRDC) has continued since then to characterise the life cycle of the virus including identification of alternative weed hosts and insect vectors. Work has also begun to develop management strategies to minimise the risk of severe disease in crops due to TSV. 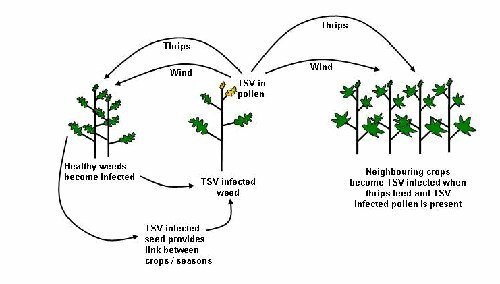 TSV is transmitted by infected pollen, which can be spread by wind or carried by insects (Figure 1). Thrips are the only known insect vector or carrier and are required for TSV infection to occur. Transmission of TSV to plants relies on the virus from infected pollen entering plant cells through the feeding injury caused by thrips. TSV can only survive on living plant tissue, pollen or in seeds. Many species of thrips are potentially capable of transmitting TSV. Work is continuing to identify the thrips species responsible for transmission of TSV into crops in CQ and it is likely that several species are involved. Severe outbreaks of TSV are favoured by climatic conditions which enable high thrips populations to develop, and large amounts of infective pollen to be produced by host plants such as parthenium. These conditions generally occur during warmer months and is highly dependent on rainfall and weed growth patterns. Seed transmission of TSV does occur in some hosts. In particular, seed transmission of TSV has been shown to occur at high rates in CQ parthenium populations. This mode of transmission enables the virus to survive through adverse climatic conditions such as drought and provides a link between seasons and cropping cycles. When conditions again favour the growth of weed hosts and thrips populations, the virus can rapidly move from TSV infected weeds (via infected pollen) into susceptible crops. There is also significant risk of long distance dispersal of TSV if infected parthenium seed is moved with machinery or harvested goods. Several field observations in early 2007 suggested that there may be significant differences in tolerance to TSV infection between sunflower cultivars. With this in mind, a field trial was conducted in early 2008 at a site north of Clermont with a history of high TSV disease levels. Fifteen cultivars from three seed companies were tested. Trial results were analysed using a Repeated measures analysis and demonstrate there are significant differences between cultivars in their tolerance to TSV infection (Figure 2). Most of the infected plants had severe symptoms of lodging, severe tip necrosis, death or a combination of these symptoms and would not have produced any yield. Hence, results of the disease incidence would correlate with differences in expected yield. These data are from only one trial at one location and will need to be confirmed and extended in the 2009 season. Several field observations in sunflower crops have indicated the highest rates of TSV disease incidence occur downwind of large areas of TSV infected parthenium (Figure 3). In these situations disease levels can remain high for some distance into the crop. For the example shown in Figure 3, disease incidence in sunflower at 5m upwind of the same TSV infected parthenium was 17%. Figure 2: Sunflower field trial assessing tolerance to TSV at 7 weeks post planting. Least significant difference (L.S.D.) = 11.0 (see confidence bar on graph). Any differences between cultivars which was greater than the L.S.D. were significant. Figure 3: TSV disease incidence in sunflower crop at 5 weeks post planting showing gradient of disease into the crop, downwind of TSV infected parthenium on the crop edge. Data points (boxes) and trend line are shown.